So if you’re a regular around here, you may have noticed the radio silence the past week and a half. I meant to post new recipes for you. My intentions were good. But I was having too much fun not working, haha! It all started with a week in Orlando. My daughter is a swimmer and qualified for a meet down there. Of course, I couldn’t let her go alone with her team, so my mom and I trekked down there for a week of girl time. When I returned last weekend, our Spring Break officially started. So, we spent the week hanging out, going on a college visit (yes, it pains me), and buying a prom dress (shoot me now). I am struggling you guys. When my son left for the Marines last year it hit me like a ton of bricks. Not only are my kids growing up, but that means I’m getting older too! I graduated college over 20 years ago. But I swear it doesn’t feel that long, haha!! Anyway, that’s where I was, in case you were wondering. If you weren’t wondering and didn’t miss me (and my lack of instagram posts), then no worries. I’m here today with a delicious breakfast cake. I suppose it technically is dessert, but it has apples, which in my opinion make this an optional pair to my morning cup of joe. 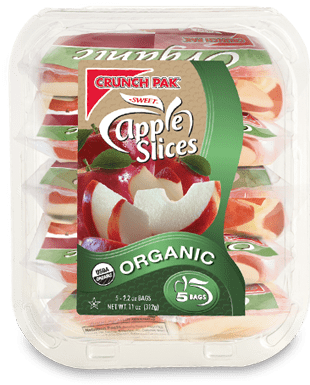 For a quick prep, I used Crunch Pak sliced apples. You’ll need about 20-30 apple slices (you can buy the big bag of Crunch Pak which makes this super easy). I peeled my apples but leaving the skins on would work too. Just make sure you dice them up small. 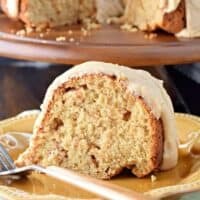 I use this Bundt pan for baking my cakes. I never have issues anymore with them sticking to the pan. Make sure you use a baking spray (I use the kind made for baking, with flour in it) or grease and lightly flour your pan. Today’s cake it pretty sticky with the brown sugar and apples! ENJOY! 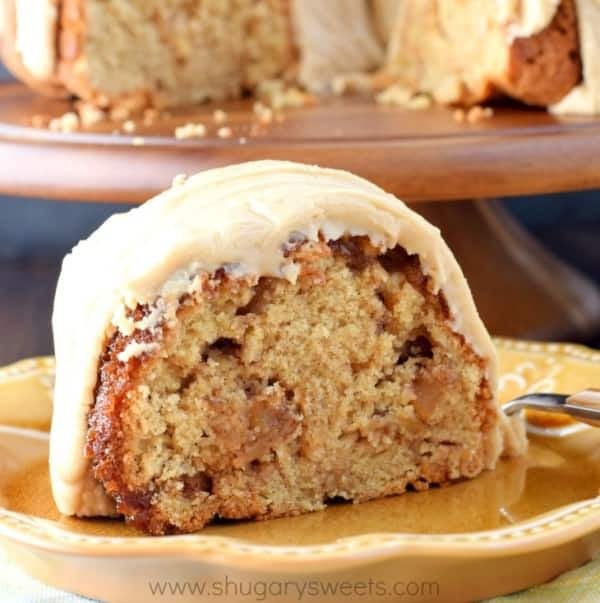 This Caramel Apple Bundt Cake is the perfect breakfast cake or dessert recipe! 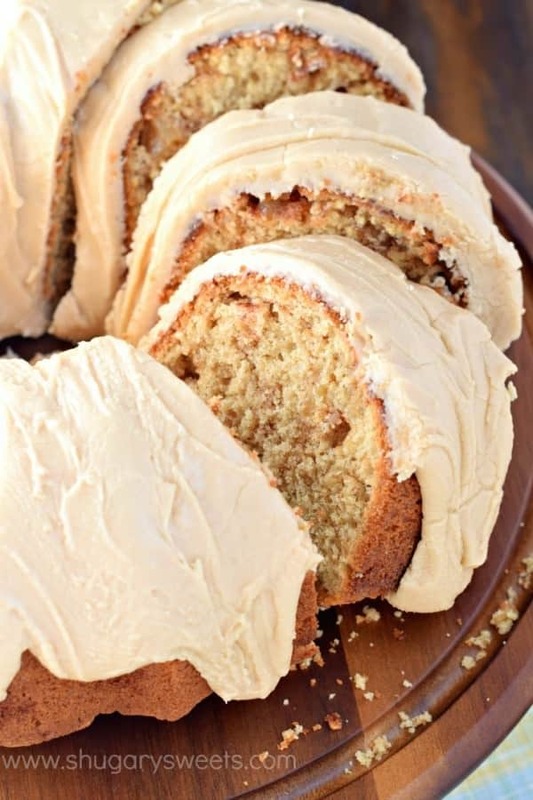 The caramel frosting is truly the "icing on the cake." For the cake, grease and flour bundt pan (or use a generous amount of baking spray). Set aside. Preheat oven to 350°F. In a large mixing bowl, combine flour, sugar, baking powder, baking soda and salt. Add in softened butter and beat until crumbly. Beat in eggs, vanilla, cinnamon and milk. 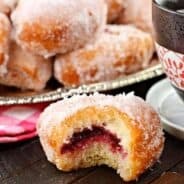 Beat for 3-4 minutes until smooth and fluffy. In a small mixing bowl, combine diced apples, brown sugar and cinnamon. Fold into cake batter. Pour cake mixture into prepared bundt pan. Bake for 55-60 minutes until browned. Allow to cool in pan for about 10 minutes, then flip onto a cake plate and cool complately. For the glaze, add brown sugar, butter and 4 Tbsp of milk to a small saucepan. Heat over medium until boiling. Stirring constantly, boil for 2 full minutes. Remove from heat. Add in vanilla extract. Allow to cool 15 minutes. In a mixing bowl, whisk together cooled sugar mixture, powdered sugar, and remaining 2 Tbsp milk. Beat for 2 minutes until smooth. Pour over cooled cake and allow to set (about 10 minutes). Slice and enjoy. Store at room temperature, covered, for freshness. 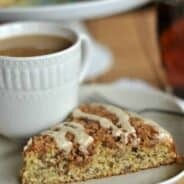 Cinnamon Apple Coffee Cake: this gorgeous cake is packed with flavor and has the texture of cinnamon rolls! 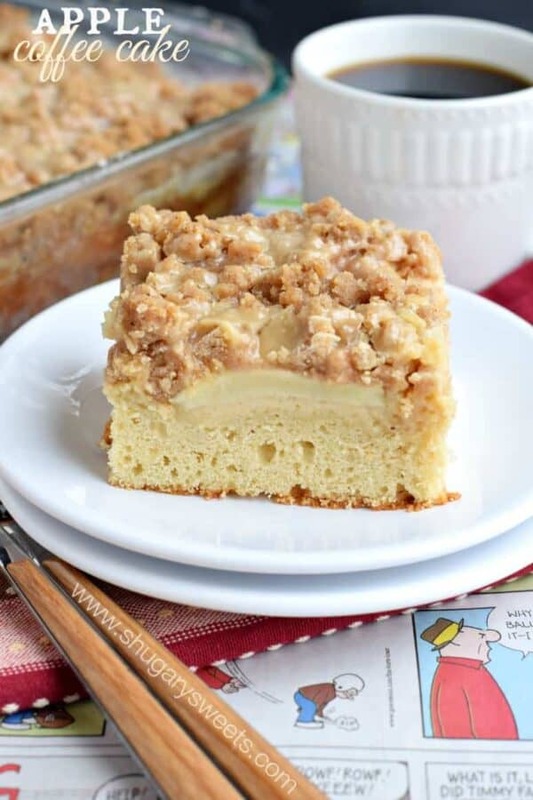 Caramel Apple Coffee Cake: this sweet breakfast cake is topped with a delicious, crunchy streusel! 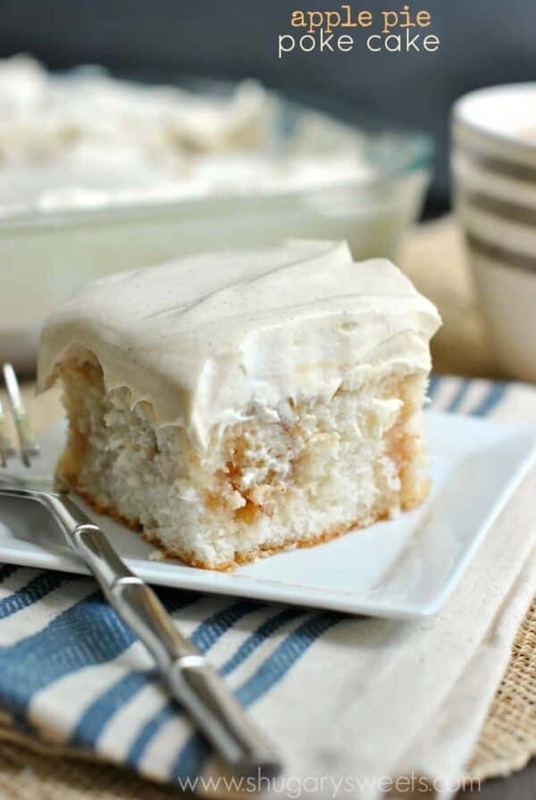 Apple Pie Poke Cake: nobody would ever know this starts with a boxed cake mix! I’m sorry you’re starting to feel empty-nested. It’s ironic that for years kids are so exhausting and take all our time, and then…whoosh. You blink and they’re people! Real ones! This cake looks amazing!! That glaze…wow. It’s a sad feeling, yet a proud feeling. Like my goals are being reached 🙂 Raise good humans, CHECK. I’ve had a ton of “getting old moments” lately! What a fabulous way to start the day off… I’m all for breakfast that is actually dessert! 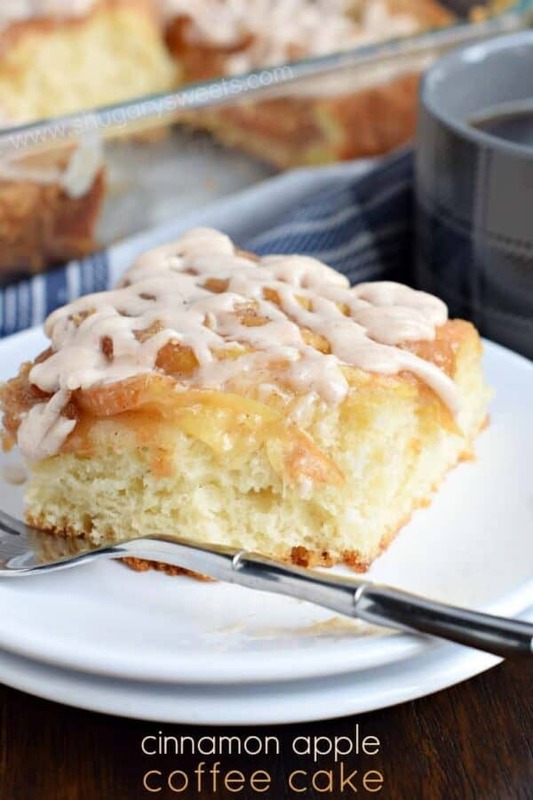 That glaze….I’ve made similar glazes like that over the years with boiling the brown sugar and adding cream and powdered sugar and it’s like no other. Truly the best glaze/frosting ever!! I could drink that frosting, no joke. And I swear, I could go lay on the couch right now and watch TV…I might just do that. Be lazy with me! Sounds like you had a wonderful time in Orlando and on your break here! 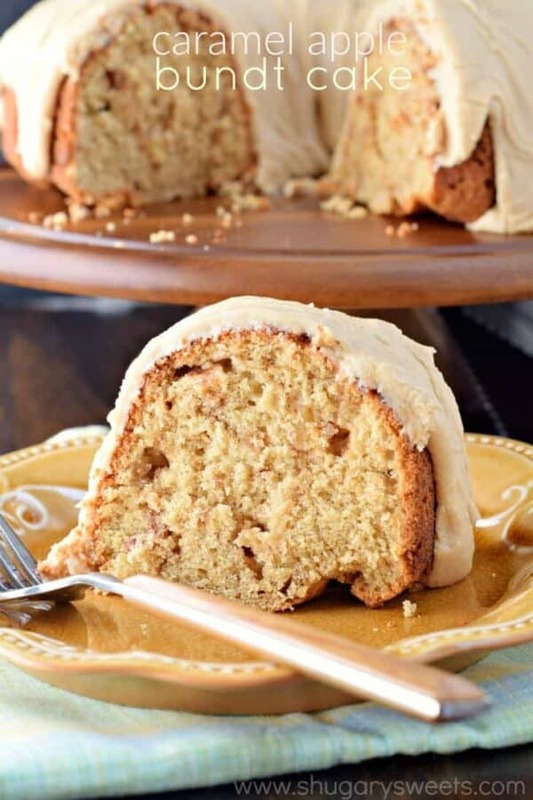 I would definitely love to curl up with a big piece (or three) of this bundt cake. Sounds SO good with the caramel and apple combo! It’s so nice to step away for a while! Though I’m glad you’re back here with this cake — it looks incredible and definitely acceptable for breakfast! Looks amazing. Love the thick frosting. Would definitely eat for breakfast,snack or maybe even dinner. I can do that now that my nest is empty. There are benefits in being an empty nester. Can u use any apples? 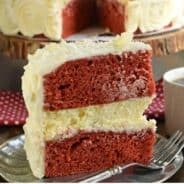 Hi, could you make this a layer cake? How would the bake time differ? The cake itself is good but the icing is to thick and sweet and it dose not look like the picture you posted. We found that the icing was to thick to drizzle. We just ate the cake it was good but way to sweet. Next time we make this cake, I would just decrees the brown sugar and powdered sugar by a quarter amount.